I've made this recipe a few times now and every time I whip it up, everyone raves at how delicious and versatile this dish is. I am such a sucker for salty/sweet/spicy/savory combinations that play off of the different flavor zones on the tongue. These dynamic flavor pairings always leave my mouth invigorated with flavor and my guests surprised by the complexity of the taste. One of my favorite ways to utilize these flavor compliments is with Asian ingredients and cuisine. The saltiness of soy, the sweetness of ginger, and the spiciness of chillies make many dishes go from just ok to over-the-top saturated with flavor. 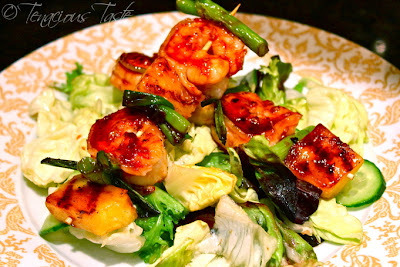 I also love one-dish-wonders, where you can make a full dish in one clean swoop and skewers are a great way to do that! 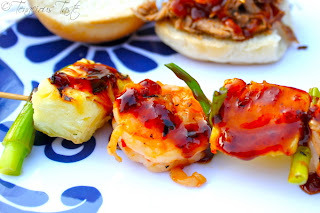 This dish is so versatile and can be served in so many different ways! Whatever you choose, this intense combination of flavors will give your guests the extra zing their mouths have been craving. 1 large container (quart sized) of fresh chopped pineapple or one large pineapple cut into 2 x 2 inch cubes. Heat grill pan over medium heat and add 1/4 tbs of vegetable oil. Grill pineapple for 4-5 min, a little less than a minute per side, making sure to get nice grill marks on the pineapple and to let the sugars from the fruit caramelize. Remove pineapple from pan, set aside, and add 1/2 tsp of sesame oil to pan. Add sliced green onions to pan, season with a little salt, and let sweat for roughly 4 minutes until tender but still crisp. Remove onions from pan, set aside, and add remaining 1/2 tsp of sesame oil and 1/4 tbs of vegetable oil. Increase heat slightly to medium-high and add marinated shrimp, cooking for about 2 minutes on each side until shrimp become pink and opaque. 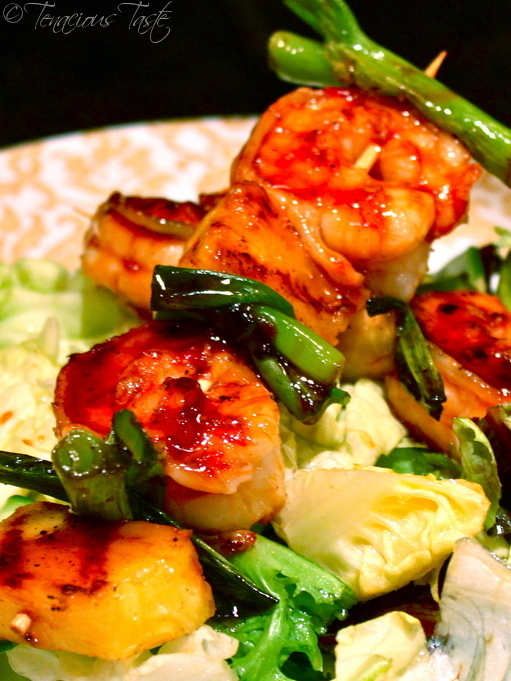 Remove shrimp from pan, set aside, and de-glaze pan with 1 tbs of mirin. In a small sauce pan, combine de-glazed pan liquid, shrimp marinade, additional 1/4 cup of soy sauce, and additional tbs of sweet chili sauce over medium-high heat. Bring sauce to a boil and reduce to half for approximately 5 minutes. Skewer shrimp, pineapple, and green onion in alternating patterns, then line up across wax/foil covered tray. Drizzle sauce over skewers and serve! It's sometimes hard to get skewers to cook evenly, so I usually skewer post-grill (and that's how I listed the steps above). But, if you want a more hassle-free cook, then just skewer before hand and be sure that the shrimp is full cooked before removal. I've made this dish several times and every time I tend to serve it a different way, but it's always fantastic! Try it over a light citrus salad, on a fluffy bed of sticky jasmine rice, or let the skewers shine on their own as an appetizer, tapa, or main event! I like to use San-J organic gluten-free reduced sodium tamari soy sauce. This company makes a ton of great organic and/or gluten-free options for sauces and dressings. The sauce for the skewers is extremely rough and when I make this dish, I usually vary the amount of ingredients based on how my taste buds are feeling that particular day. Basically, there is no exact science for this sauce. You can add more chili sauce for extra spice or tone down the sodium by diluting with a little water. You may even want to introduce other ingredients to the mix! I use Mae Ploy Sweet Chili sauce in this recipe and you can find it at almost any grocery store in the ethnic foods aisle. I like the flavor and heat combination, but other brands would be just as good!